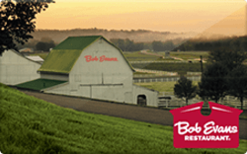 Bob Evans is a restaurant chain that serves farm fresh food. Buy a discounted gift card to save on the delicious food. Gift card works like cash and can be used anytime with any deal or promotion that is being offered.